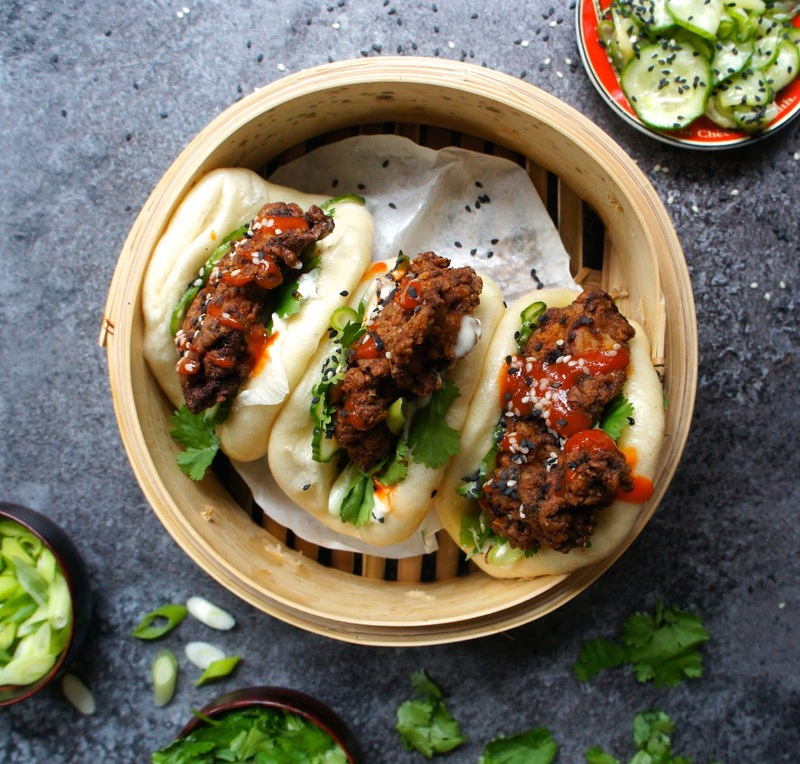 Gua Bao, often known quite ambiguously as just ‘Bao’ – which would be like saying ‘bread’ or ‘wrap’ – is a Taiwanese street food made to melt hearts and stomachs alike. They are little cloud-like white buns in which you’ll find a varity of magnificently cooked meat (crispy duck, braised pork belly, fried chicken…) accompanied by tangy, crispy, saucy and spicy flavours. My perfect Gua Bao comprises of magnificent meat, something pickled, something spicy and a (very important) crunch. I can’t even begin to explain how excited I was to make this at home. 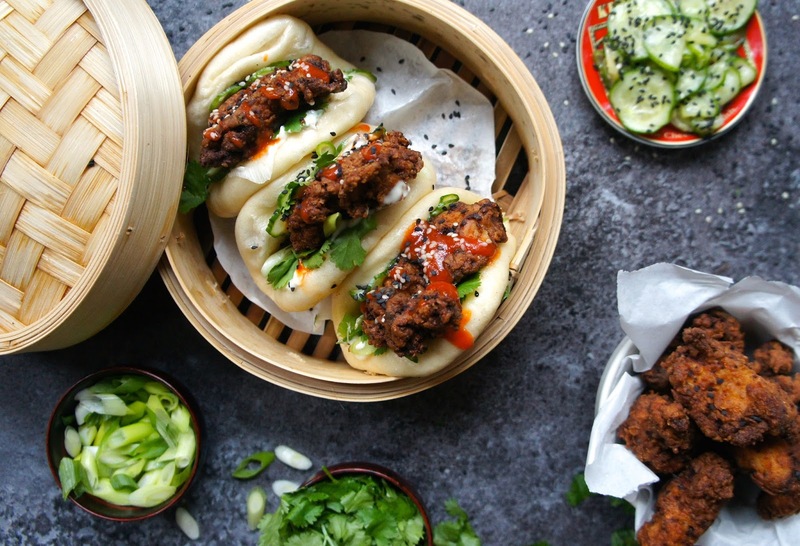 Lucky enough for me, gua bao, having become hugely popular on the London food scene, is now very easy to come by if you know where to look, with my favourite being Bao London in Soho. From 6pm onwards you’ll find hoards of bao-lovers queuing to experience the wonderment inside. They recommend two gua bao per person. We had four each. 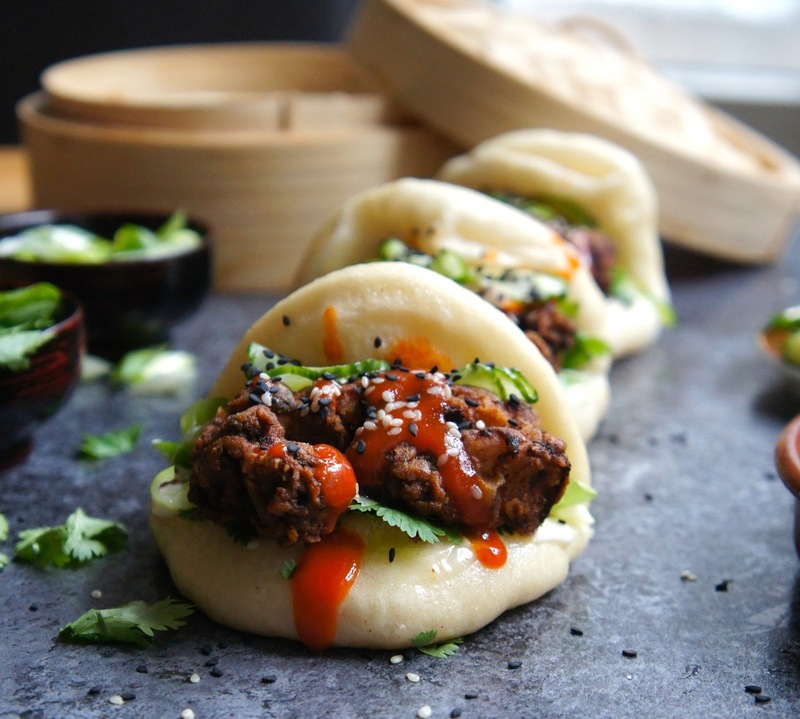 Having never made the gua bao itself before, I did quite a lot of research for a recipe that would help me not fail, and ended up going for the recipe from the London bao man himself, John Whaite, found on the Telegraph website. 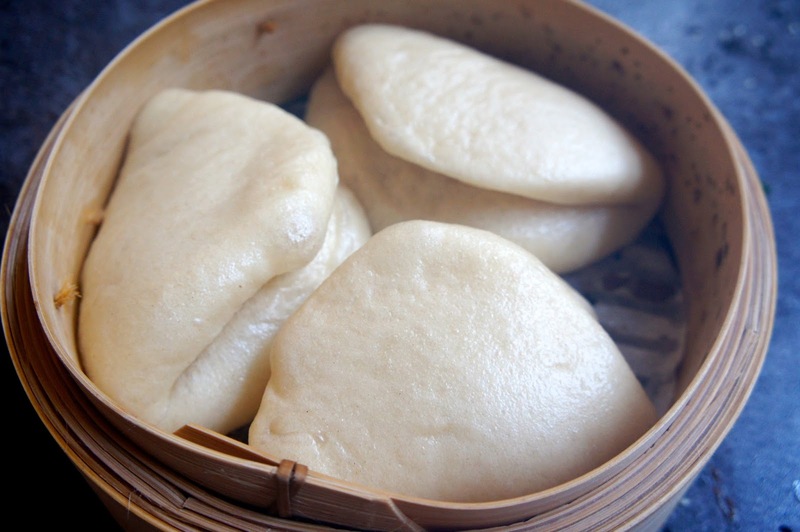 A pre-blog recipe test showed me that this recipe is a winner, resulting in incredibly fluffy and delicious gua bao with a terrifically easy process. Yes, even you can make it. 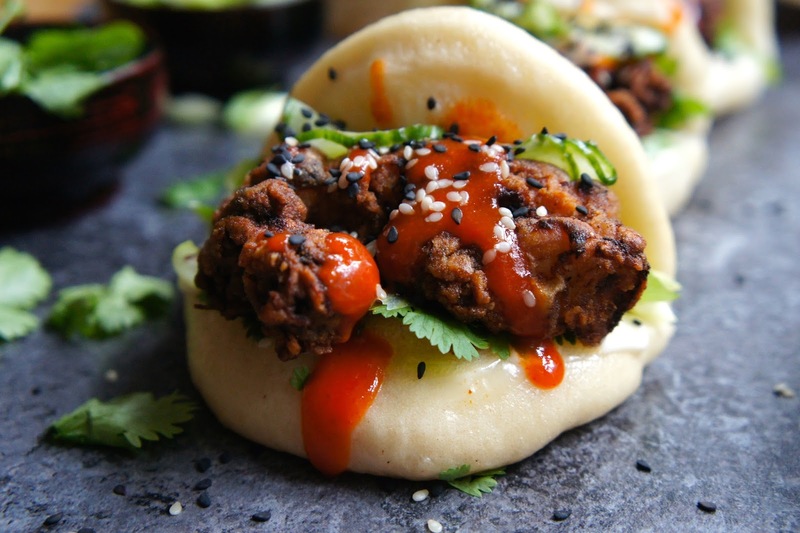 Spicy fried chicken is another thing I’ve been wanting to make for a lifetime, having experienced Asian style fried chicken in Bao as well as some fish sauce style fried chicken wings cropping up around London. I wanted to marinate them in buttermilk (cause we all know that works wonders) and I wanted to add some spicy Asian flavours, so I did – and it turned out magnificently. 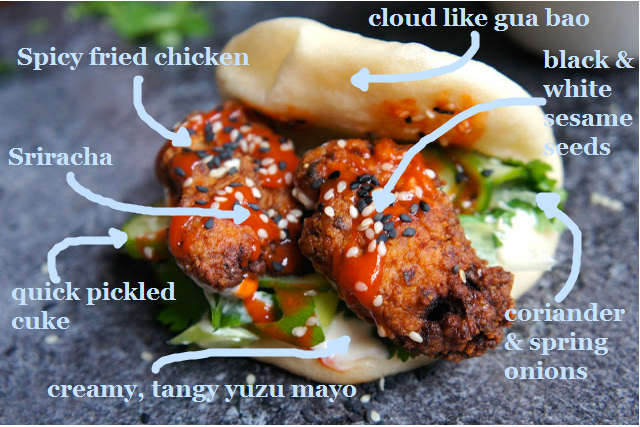 Combining the cloud-like gua bao and spicy crispy chicken with some tangy yuzu mayo, quick pickled cuke, the usual Asian green stuff and some sriracha resulted in a mind blowingly incredible bao experience. I’ll repeat that – a mind blowingly incredible bao experience. Isn’t that what everyone wants for Christmas? 8. Steam gua bao – prepare remaining ingredients (coriander spring onion, yuzu mayo) whilst gua bao is steaming. It is more important that the gua bao is warm when serving rather than the chicken, which will still be gorgeous & crunchy if it’s slightly cool. 1. MIXING: Mix the flour, sugar, salt, baking powder and yeast together in a large mixing bowl. Add the water and milk and bring the mixture together into a rough dough. It will be quite dry but don’t worry, the dough will loosen as you knead it. Tip the dough onto a clean surface and knead by hand for 10-15 minutes until the dough is white, smooth and no longer sticky. Place the dough in a lightly oiled bowl (using vegetable oil), cover with a clean cloth or cling film and allow to rest for about an hour in a warm room, until the dough has doubled in size. 2. SHAPING: Once the dough has doubled in size, remove from the bowl, knead for a few seconds and roll into a fat sausage. Using a dough cutter and a guillotine motion, divide the dough equally into 15 portions of 60g each. Roll these pieces into tight balls by folding the sides in to the middle of the dough and rolling them against the table lightly with your palm. Press them into neat ovals and roll with a rolling pin to flatten. Grease the ovals lightly with oil and fold them around a chopstick so they look like lips. Place on a baking sheet, not too close together as they will rise further, and cover with a light cloth. Rest for 20 minutes. 3. 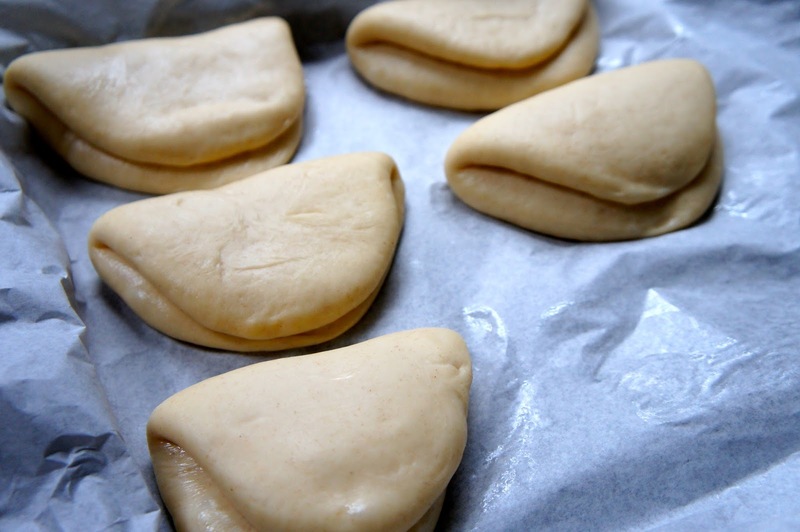 STEAMING: Prepare a steamer (bamboo or regular) by lining the base with baking paper. Set it over a barely simmering pan of water. Once the buns have rested, place them in the steamer, evenly spaced (you will need to do this in batches) and steam for 15-20 minutes until swollen, smooth and resilient to a gentle prod. Make sure the water isn’t boiling when you start the steaming and keep the water on a low heat, very gently simmering throughout. 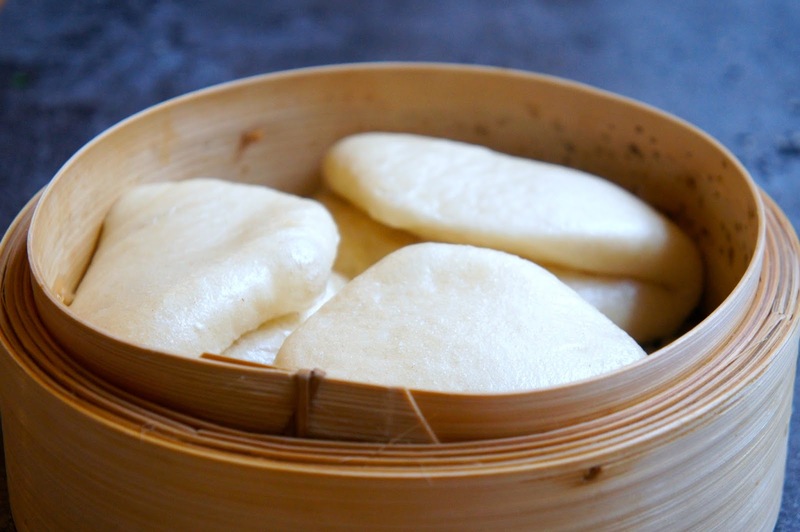 You will want to gently steam the buns to avoid them puffing up too quickly and collapsing. Remove from the steamer and allow to cool for a few minutes before filling with your delicious chicken. 1. MARINADE: Cut the chicken thighs into strips (two or three strips per thigh, not too small) and mix in a bowl with the buttermilk, 2 tsp salt and a pinch of cayenne pepper. Marinade for 5 hours or overnight (as long as possible). The salt helps keep the moisture in the chicken when you fry it, so it will be extra juicy. 2. SPICY FLOUR: When your chicken is ready to fry, mix the flour, garlic powder, grated ginger, Sichuan pepper, salt, five spice, chilli pepper, pepper and a 1 tbsp buttermilk in a large bowl. The extra tbsp buttermilk helps create lumps off deliciousness that attaches itself to the chicken pieces to create crunchy bits. 3. DUNK THE CHICKEN: Prepare a piece of baking paper on a tray. One by one, give your chicken strip a slight shake over the buttermilk bowl to get rid off excess buttermilk and dunk them in the spicy flour mixture. Coat the chicken strip evenly in the flour mixture and move to the tray. 4. FRY: Heat two inches of oil or so in a wide, heavy based pan. Heat until it reaches 190C (375F). You will know the oil is ready when a pop corn kernal pops or put the handle of your wooden spoon in the oil, if it bubbles steadily then it’s ready, if it’s too vigorous then your oil is too hot. Fry your strips in small batches for 6-8 minutes until golden brown and crispy. Keep an eye on the oil temperature so it doesn’t get too hot (better to have them take longer rather than burn them) and don’t over-crowd the pan. 1. CHOP THE CUKE: Very thinly slice your cucumber with a sharp knife or a mandoline. Mix the slices with 2 tsp flaked sea salt and put the slices in a colander over a bowl or a pan. Put a small plate on top of the cucumber and a weight (a jar of something or a pestle and mortar) on top of the plate to squeeze the water out of the cucumber. Leave for 15 minutes. 2. PICKLE THE CUKE: Rinse the cucumber slices under cold water and squeeze out any remaining water. Mix the cucumber slices in a bowl with the sugar, rice vinegar and water. 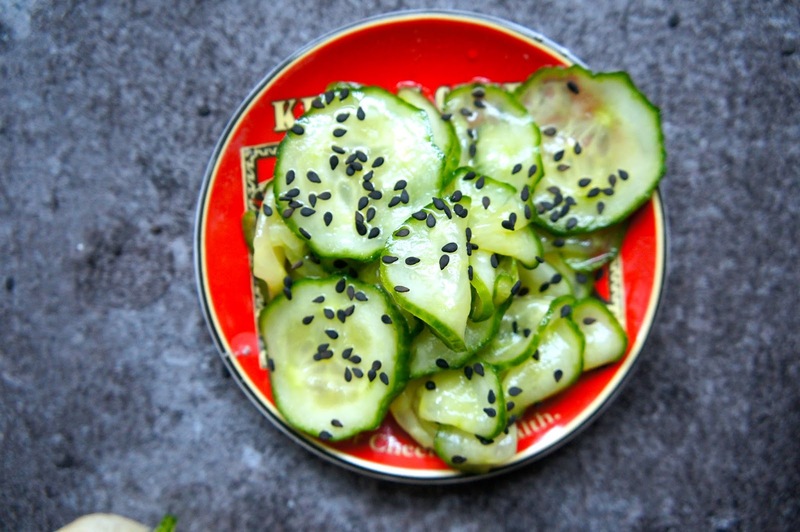 Top with black sesame seeds if using. 1. YUZU MAYONNAISE: Mix 3 heaped tablespoons mayonnaise with 1 tablespoon yuzu juice. Top with a sprinkling of cayenne. 2. BAO BUILDING: Spread some yuzu mayonnaise on the base of the bao. Top with picked coriander leaves and spring onion slices. Add your fried chicken piece or two (if it fits) and top with some pickled cucumber and a drizzle of sriracha. Sprinkle on some sesame seeds and you’re good to devour.